Who doesn't love a good red lipstick? It can be very hard to find the right shade but I have discovered after a lot of experimentation that bright blue-based reds suit my pale neutral skin best. The blue undertones also make my teeth look whiter so that is another big plus! So without further ado, here are the red lipsticks I reach for most. This brand is inspired by vintage makeup and this shade in particular has been recreated from an actual lipstick shade released in 1945. I love that this one has almost a cherry blue undertone of all of them. It is a gorgeous velvet semi-matte that has insane colour payoff with full coverage in one application. I was also blown away by the formula for a lipstick that costs basically the same as a high range drugstore one. It really feels like a high end luxury lipstick. It is creamy and comfortable and also last very well. Seriously, it feels so nice on the lips! I'm pretty sure I used this one most because of the gorgeous finish and the easy application. 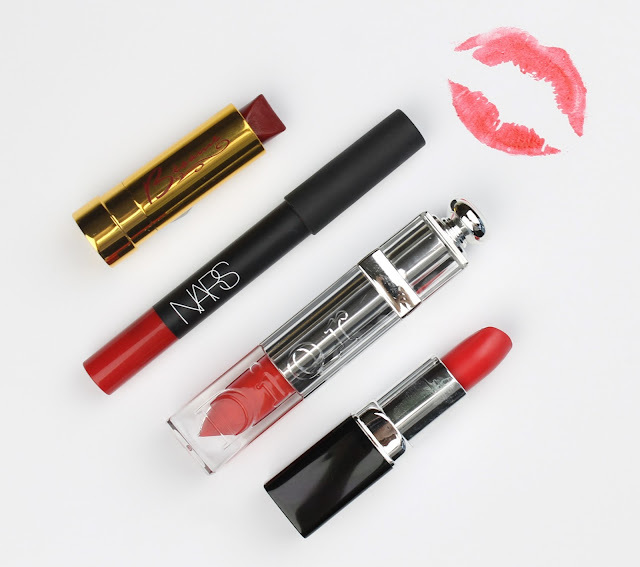 Red lips can take quite a while to apply and be a bit high maintenance but the pencil application makes things so much quicker and easier for an everyday red lip. I love the matte finish and long lasting formula most of all. It is matte without drying out my lips and just looks so amazing. Because of the velvet finish too, the lack of gloss certainly makes it a lot more wearable. This is the one I reach for when I am looking for a high impact, super glossy red! This formula is amazing too. It stays super glossy even as it sets so it doesn't slip all over your lips. The staying power is great too and while it won't survive a meal, it certainly lasts way longer than a lipgloss with a ton more colour payoff too. It's difficult to explain and I've never tried a formula quite like it but if you want the glossiest lipstick possible this is the one for you. It comes in another slightly warmer red called Pandore which I also love. I have sung many praises of this great Aussie brand and I particularly love this lipstick. Again, it has the matte finish which makes it more wearable for every day while still being really polished. It also lasts really well; probably the best of all of these lipsticks. Its a gorgeous true red that leans slightly blue. It Girl and Socialite are definitely my favourite shades from this matte lipstick range. Left to right: Bésame American Beauty, Nars Dragon Girl, Dior Wonderland and Harlotte It Girl. The right red lipstick shade can give you so much confidence and really give you a classic polished look when paired with the simplest bright skin and black liner. A lot of people don't wear reds because they think they don't suit them but, like nudes, it is just a matter of finding the right red that suits your undertones and colouring. What is you favourite red? Have you tried and loved any of my favourites? Let me know in the comment section below. I would love to hear from you.